with brilliant, penetrating dynamic contrast. The solid oak cases and quality of workmanship have allowed many of the instruments to continue in use to the present day. 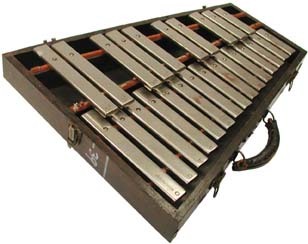 The bars were triple plated to prevent rust, and came in four sizes: 7/8 x 3/8 inch, 1 x 7/16 inch, 1 1/4 x 7/16 inch, and 1 1/2 by 1/2 inch. 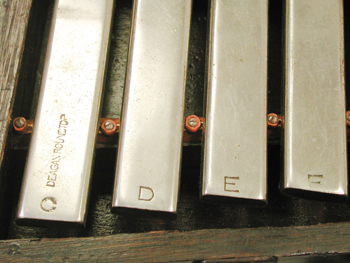 Each size of bar was available in 2-, 2 1/2-, or 3-octave ranges. They were available in either folding cases or in solid “flat” cases. This instrument is Model No. 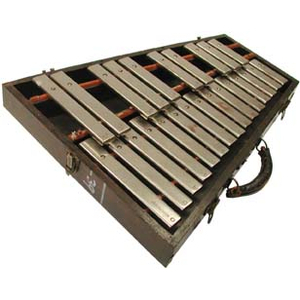 1228, a 25-bar, 2-octave (C to C) instrument. The bars are 1 1/4 x 7/16 inch in size, mounted in a flat case. The case measures 18 5/8 inches at its widest end, and is 25 inches long. The list price in 1914 was $40.00.